I enjoy arguing about possible definitions of poetry - well I enjoy arguing anyway but it's especially pleasurable to argue about something which is as difficult to define as the above. I usually say something like: The only thing which defines a poem is that the lines don't run to the edge of the page. (I disregard so called prose poems). 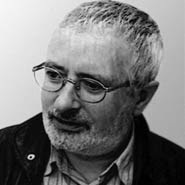 I was delighted then when Terry Eagleton in his book How to Read a Poem offers this definition: A poem is a fictional, verbally inventive moral statement in which it is the author, rather than the printer or word processor, who decides where the lines should end. I'm enjoying the book. It's a wide ranging and comprehensive look at poetry criticism which the author says seems to be something of a dying art. It's also highly entertaining with quite a number of Irish references as you would expect from Eagleton. Yeats figures prominently in it as well as Mahon and Heaney and the author even has a swipe at the way Van Morrison uses sudden snatches of passion and heartfelt breathing to try to enhance his singing of old Irish songs. Terry Eagleton in the Times online on how to read a poem here. 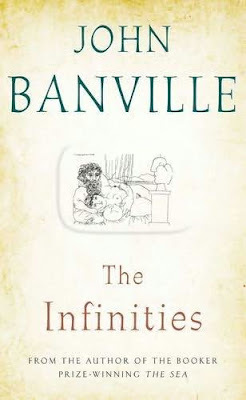 I'm a great fan of Banville, reviews of this new one suggest that its up with his best. Eagleton is always an interesting read, able to poke fun where appropriate. I read his Introduction to Theory and The Meaning of Life - A Very Short Introduction (I won't tell you, you have to read it yourself) last year and enjoyed both. I have read too many how to write books most of which are depressingly similar. This one looks a little different. I'm not familiar with any of Kooser's poetry so this may make me want to read it or possibly the opposite. 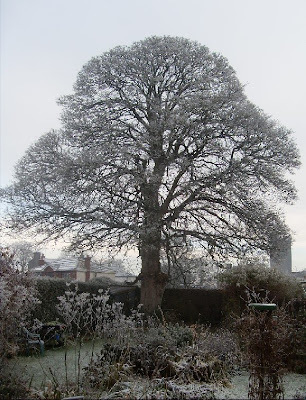 The sycamore tree on Christmas Day. 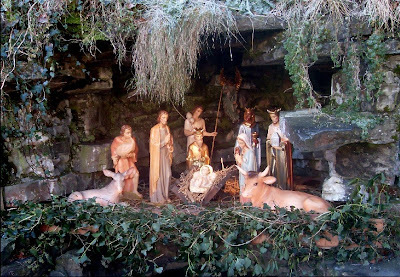 Outdoor crib at St Patrick's Church, Trim. Wherein a child is laid. from Verses on the Nativity in Verses on Doctrinal and Devotional Subjects by Rev. James Casey PP, (1824 - 1909) a native of Riverstown, Co Sligo. The book was published by James Duffy and Sons in 1882 and was such a success that a second volume was published in 1886. 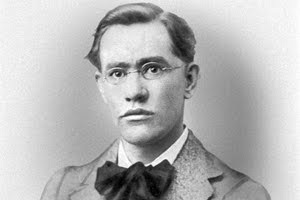 He also published books of poetry on Home Rule and on Temperance. 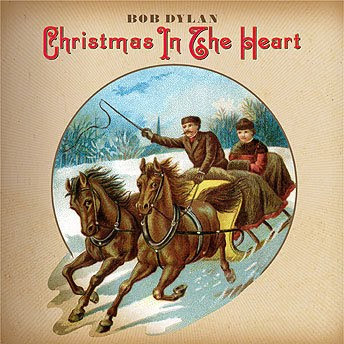 Ok so finally I come to the Dylan Christmas album Christmas in the Heart. I bought this some weeks ago, the deluxe version which included ten Christmas cards of the album cover! I didn't dare send them to anyone. I held off listening to it for two reasons. 1. I don't like the premature arrival of Christmas - the Christmas trumpery and the Christmas songs in shopping centres in September and 2. the fear based on snippets heard that it was a terrible album. I've listened to it a few times this week and I'm relieved. It's a Christmas album with a mixture of the secular and spiritual, the serious and jocular. A good listen and well worth the wait. Best tracks ? Must be Santa - where the list of reindeer names include US presidents from Eisenhower to Clinton - and O Come All Ye Faithful - just to hear Dylan sing in Latin. All proceeds from the album go to feed the hungry. Of course the critics have had a great time trying to analyse the album. If it's by Dylan then there must be some deeper significance, hidden sub plot. It's just a collection of favourite Christmas songs delivered in a traditional way. Here and there the man has difficulty with high notes - as on Hark the Herald Angels Sing - but come on, it's Bob Dylan after all. So I didn't win a prize, get commended, or even get shortlisted in the Basil Bunting Poetry Award. The organisers are to be commended for putting the results online promptly, putting the winning poems online and including the judges comments. In some competitions the results don't even appear on the internet. I like these comments by the judges Sean O'Brien, Linda France, Paul Batchelor: The weaker material had usually failed to address form at all, and thus had few strategies for shaping a poem at the points where imagery faltered or narrative lost impetus. The judges would have liked to see more generally a greater control over language and form, more clarity of argument and narrative and a stronger sense of risk and urgency in the entries. I think more and more that form is crucial in all kinds of writing not just poetry but in poetry it is crucial. A well wrought poem should demand its own form which often can only be arrived at by a tedious process of experimentation. The sense of risk and urgency mentioned seems to be what often attracts the attention of judges. You do need something to make your entry stand out among the 913 other entries as in the Basil Bunting Award. The only Irish resident among the winners and listed is Louth writer Barbara Smith who blogs here. Well done Barbara! Above my picture from 2007 of the entrance to Auschwitz under the Arbeit Macht Frei sign which has been recently stolen. The slogan is usually translated as Work makes you free. The Wikipedia article here gives an account of its widespread use before the Nazi era in Germany (assuming that the information is correct) starting with its use as the title of a novel in German in 1872. 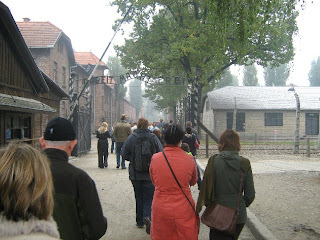 It even suggests that at Auschwitz it may not have been intended as a mockery or a cruel joke. It seems to me that the slogan or variations of it such as A Career Will Set You Free has been widespread all through the twentieth century as an enticement to people, men generally at first and then women to give their best years to their work. Calling work or the job a career was a master move by employers raising what is and was a means of earning a living, putting bread on the table, to something which pretends to be far more significant or important. How important a person's career actually is is best seen in a recession when unemployment is rampant and careers are cut short without mercy or warning. And then there is the attack on the public service! But don't get me started on that. Thank God I was able to retire when I did. I wrote a poem after my visit to Auschwitz which this year was published in The Stony Thursday Book, Limerick. Anyway I note that the stolen Auschwitz slogan has been replaced by a replica. Good turn out for the Readings and Open Mic last night in spite of the inclement conditions. Just short of twenty people there to hear two contrasting reading, each spell-binding in its own way. Michael Clemenger read from his recently published Holy Terrors. He read an extract describing the experience of his confirmation in Tralee where he was an inmate of the Industrial School. He also read a poem he wrote recently after visiting the grave of an inmate who had been killed there. The other reader, Brendan Carey Kinane, launched his poetry chapbook Racket in the Air and read from it. His poems are closely written, carefully crafted meditations on real life situations with wonderful use of language. Among the open mic readers were Caroline Finn who read on Sunday Miscellany last Sunday and Peter Goulding (who blogs here) who made the trip from Dublin to read some of his humorous Christmas poetry from his recently published A Flash of Orange. A feature of the open mic was the great variety of material and style to be heard, congratulations to all who took part. MC Paddy Smith ended the night suitably with his We Three Kings prose piece? monologue? Picture above: Featured readers Michael Clemenger and Brendan Carey Kinane. WHAT? Must I always be a listener at these readings? not to mention that one's love ditties. Shall I never be avenged? shows no sign of coming to an end? Obviously they didn't have Open Mic sessions in Rome. Luckily we have now and we also have vigilant MCs who ensure that participants don't rant or spout on too long. An open mic session is a bargain - I'll listen to yours if you listen to mine. It gives writers a wonderful opportunity to get feedback from an audience for their work. Our Open Mic is on tonight in the Village Hall, Knightsbridge Retirement Village, Longwood Road, Trim at 8pm. We have two very interesting featured readers as mentioned in yesterday's post and we welcome participants in the Open Mic. Our MC, Paddy, decides on time allowed based on the number of participants and keeps very strict time. Expressions such as "rare bird," "who watches the watchers?" 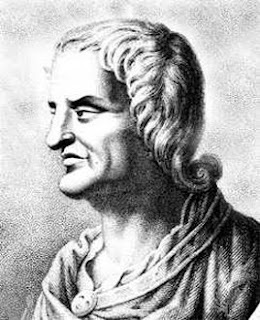 and "bread and circuses" come from the Satires of Juvenal. Our next Boyne Reading and Open Mic takes place tomorrow, Thursday in the Village Hall, Knightsbridge, Longwood Road, Trim. 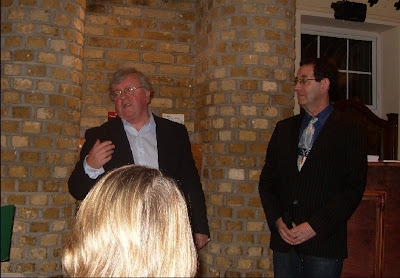 The two featured readers are Michael Clemenger (right) and Brendan Carey Kinane. Michael Clemenger will read from his book Holy Terrors published last month by O'Brien Press. This is his inspirational account of how he rose above years of sexual abuse to become a psychiatric nurse and a lecturer in biological sciences. He lives in Trim. Report in the Meath Chronicle here. 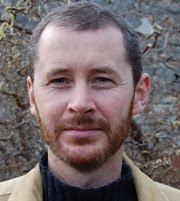 Brendan Carey Kinane is a member of Boyne Writers Group and has won numerous awards in international poetry competitions. He wrote the winning entry in the 2007 Boyle Arts Festival Poetry Competition. Born in St Margarets, Co Dublin he now lives with his family in Athboy, Co Meath. Whatever you say about the GAA and its place in modern Ireland you can't beat the fervour of a local club game for excitement and passion. I was at the Leinster Junior Club Football Final last Sunday in Louth village, Co Louth. The local team, St Mochta's, won the Louth championship and were playing against the Meath champions Longwood. The final had been drawn the previous Sunday in Longwood. I was supporting Longwood. After a ding dong struggle Longwood managed to win by a point. The game had everything, noisy fans, a missed penalty, plenty of yellow cards, three red cards, great scores and bad misses. And my connection with the south Meath village of Longwood? My son-in-law plays at number 4 for the team. Small for a corner back he makes up in tackling ability what he lacks in height. He had a good game, made a number of vital score-saving tackles especially in the second half and displayed an acting ability which up to now had been hidden! The Irish Independent match report is here. I had never been to that part of Louth before between Ardee and Dundalk. I passed through he award winning village of Tallonstown, Co Louth. I noticed an almost life size sculpture in the village but didn't have time to stop and investigate. An internet search reveals that it is a very recent work by sculptor Ann Meldon Hugh of Vere Foster, the founder and first president of the INTO, who introduced a series of famous copybooks into Irish schools. A place to return to and linger in . . . . sometime. I've just finished a course of lectures at Yale University. No I haven't been out of the country I listened to them via the wonderful Open Yale Courses site. You can download the lectures as audio and as video as well as transcripts of the lectures and extra notes for each lecture. You can even download the exams and have a go! The course I listened to was Dante in Translation with Professor Giuseppe Mazzotta which consisted of twenty four one hour lectures. The course is an introduction to Dante and his cultural milieu through a critical reading of the Divine Comedy and selected minor works (Vita nuova, Convivio, De vulgari eloquentia, Epistle to Cangrande). Very enjoyable. The professor, as we used to say, "knows his stuff" and from the two video lectures I watched seemed to lecture without the use of notes. As a former teacher I was most interested in his methods and the equipment he used. Talk and chalk were his preferred option; no powerpoints, no slides, just talk and the odd phrase or work written on the board. He also spent quite a while answering questions from the students and the last session was a recap mostly by answering such questions. I was delighted to see that the front rows of seats in the lecture theatre were empty, students and lecture goers are the same the world over!! 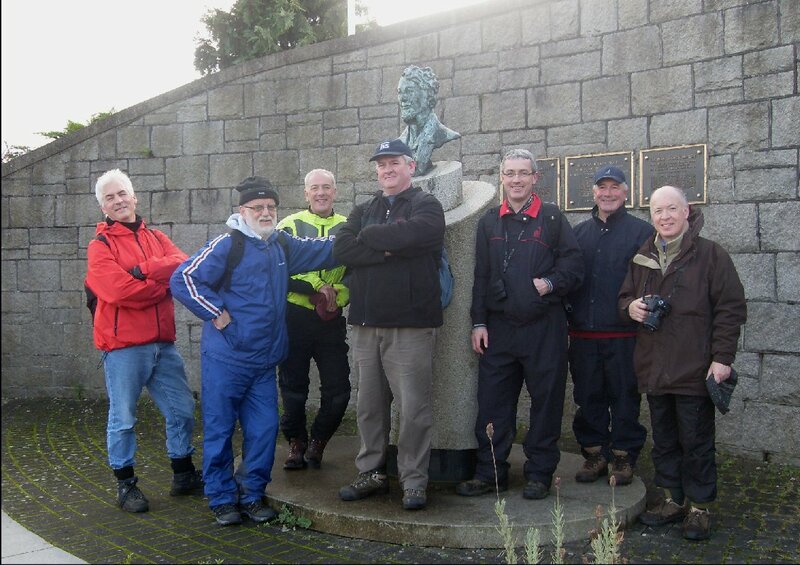 Some classy-looking plaques have made their appearance at various points around the town recently and we learned yesterday (Friday) that they mark the 22 historic sites on a new tourist walk around Trim and its environs. The walk was officially launched by the Town Council Cathaoirleach, Ray Butler, at a pleasant ceremony in the Visitor Centre in the Town Hall. Tea and scones helped to make the occasion even more enjoyable, though it was a little too soon after lunch for me to partake with my normal enthusiasm. Not all that many local dignitaries in attendance, which is a pity because it's little things like this that complete the jigsaw - a word used by several of the speakers at the opening. We had a representative from Failte Ireland, which put up a significant amount of the money that the whole venture cost. Some of this money went on printing an A4 map of the walk on good quality card-type paper, though I notice a small error; although St Patrick's Church and St Patrick's Cathedral are correctly marked on the map, a picture of St Patrick's Cathedral has the caption: St Patrick's Church. Tsk, tsk. Noel French lived up to his description at the function as the eminent local historian by taking the small crowd on part of the walk and giving an entertaining and very wide-ranging little talk at each stop. 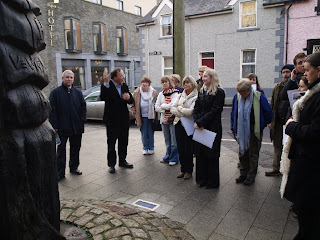 Two pictures of Noel conducting the walk, above at the bog oak sculpture of the Salmon of Knowledge by Oldcastle sculptor Joe Burns, with the Rowan Hamilton mathematical formula inscribed on it and below at Trim Castle. Congratulations to Boyne Writers Group member, Caroline Finn, whose piece entitled The Holly Gatherers will be broadcast on Sunday Miscellany on RTE1 this Sunday 13 December. The programme will be available for listening on the website and as a podcast after broadcast. Caroline read this piece at one of our recent meetings and we were very impressed with it. Well done! 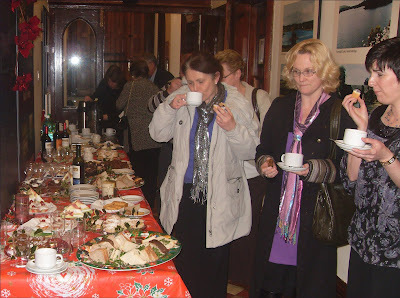 Last night's Christmas Cheer with LitLab members in the Cavan County Museum Ballyjamesduff was an enjoyable affair. Plenty of good poetry, prose and songs mostly with a Christmas theme. No holly - jolly rhymes either but a great mixture of the funny and the serious. The night was organised by Heather Brett whose enthusiasm and ability to get things done is unsurpassed. This has been a good year for LitLab with members being published in many places, being noticed in competition and being included in Writers and Artists 9 by Windows Publications. The County Museum, in a former convent, seems an interesting place and I made a mental note to visit it in the new year. Tonight our Boyne Writers Group Christmas meeting. Paddy Smith cleverly disguised as a Wise Man reading his piece with that title. Paddy Halligan contacting the Samaritians though he thinks it is a dating agency. Is that a mobile phone? The food and the company was just as good as the readings and the music. Sorry Sir, We don't actually serve many coffees here, the barman told me in McDowell's bar, Inchicore, last evening when I asked him if they had any biscuits or bars to go with my coffee. I was there for the annual Francis Ledwidge Poetry Awards and he probably served more coffee last night than he did the whole rest of the year. A most enjoyable event, a very friendly atmosphere with great poetry some serious and some not at all serious. Inchicore Ledwidge Society chairman Liam O'Meara and secretary Michael O'Flanagan made everyone feel at home, remarking on the mix of old friends of the competition and new names present. 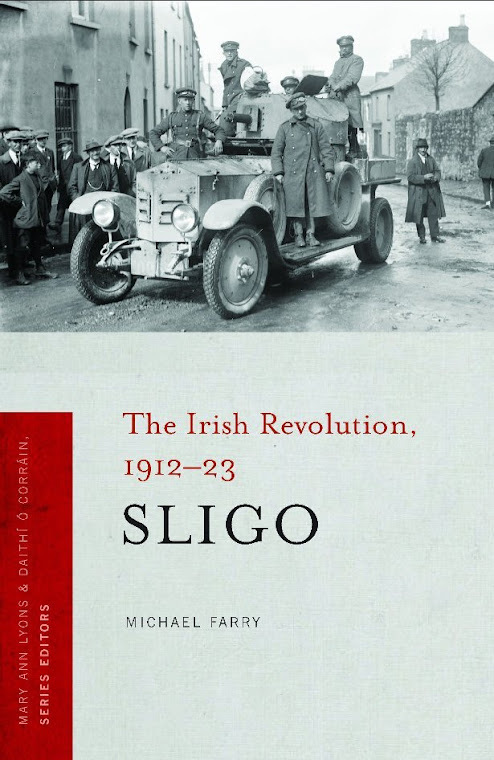 Liam has done extensive work on Ledwidge and has published a biography of the poet. 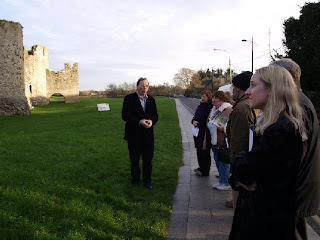 He explained why there is an Inchicore Ledwidge society - the poet spent some time in the nearby Richmond Barracks. Liam is working on a history of the barracks. Most of those mentioned in the awards were present to read their offerings and receive their awards. Third prize winner, our group member Evan Costigan was represented by his parents and his poem was read by a friend. Second prize winner, Mary Turley McGrath, travelled from Donegal to read her poem Transitions. 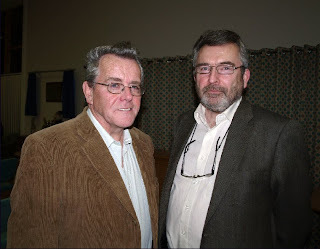 This year's winner Ray Mullen (pictured above with Liam O'Meara) had only to come from Tallaght. His poem Lucia was short, abrupt even with a wonderful ending. A worthy winner! He paid tribute to the Virginia House Writers Group in Tallaght of which he is a member. Ledwidge would have been proud of the poetic representation from his native Meath. As well as myself- a blow-in of forty years standing - Orla Fay and Sinead McDevitt read their commended poems. Orla's got special mention being on the theme of Ledwidge himself. Sean Ross, also from Meath, was unable to be present. I was asked to read the highly commended poet by Adrienne Leavy a Dundalk native now living and studying in Arizona. A daunting pleasure to read someone else's work in public, not full aware of all the nuances of its language but determined to do it as well as possible. After the awards there were readings from society members, former winners and Liam and Michael read from their work to great acclaim. Kilkenny poet, Willie Joe Meally, who was also at the Kavanagh weekend, was present and recited one of his poems about Kilkenny coalminers by heart and also gave us a song. All in all a great night. 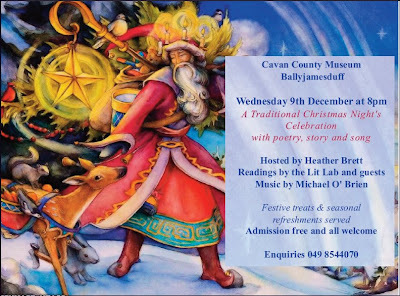 Tonight Ballyjamesduff for poetry, prose, songs and Christmas Cheer! A night of poetry, story and song in Ballyjamesduff, Co Cavan tomorrow evening Wednesday 9 December, 8pm. The LitLab crowd will be there. All welcome. Tonight off to Inchicore, Dublin for the Francis Ledwidge International Poetry Awards to collect my Commended certificate and read my poem. Do you paint yourself? was the question I was asked most often last night at the launch of the annual exhibition by the Castle Art Group, Trim . No I don't paint myself though I would probably look better if I did. Two of the group members are also members of our Writing Group. Where do they get the time? The large attendance at the launch included the local government minister, Noel Dempsey, our new Parish Priest and Yvette Bloomfield, President of Trim Chamber of Commerce, who launched the exhibition. There are, as you might expect of such a historic town, many paintings of Trim Castle, the Yellow Steeple, the Wellington Monument and various other streets and scenes in the town. But it's not just Trim. There are paintings of Moore Street and Grafton Street, Dublin, Ross Castle and Killarney Cathedral, Kerry, Kilkenny, Venice, and even Havana and Australia. 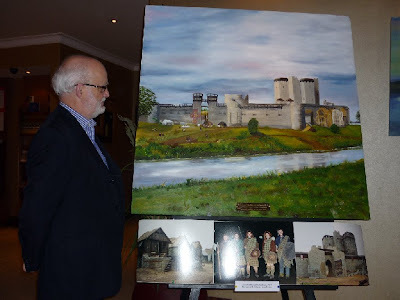 The most striking painting is the large one pictured above of Trim Castle as it was for the film Braveheart. (More on the film here.) This painting is a co-operative effort by six members of the group - Teresa McCole, June Smith, Jenny Andersson, Anne Crinion, Sheila Keating and Angela Kelliher. An impressive record of a historic event in Trim, it would look well in a public building in the town, a hotel, tourist office or the like. Eight artists are represented in the exhibition and ten per cent of sales go to Meath Palliative Care. The artists in addition to those mentioned above are June Hesnan and Christy O'Reilly. The exhibition, in Trim Castle Hotel, will continue for five days. 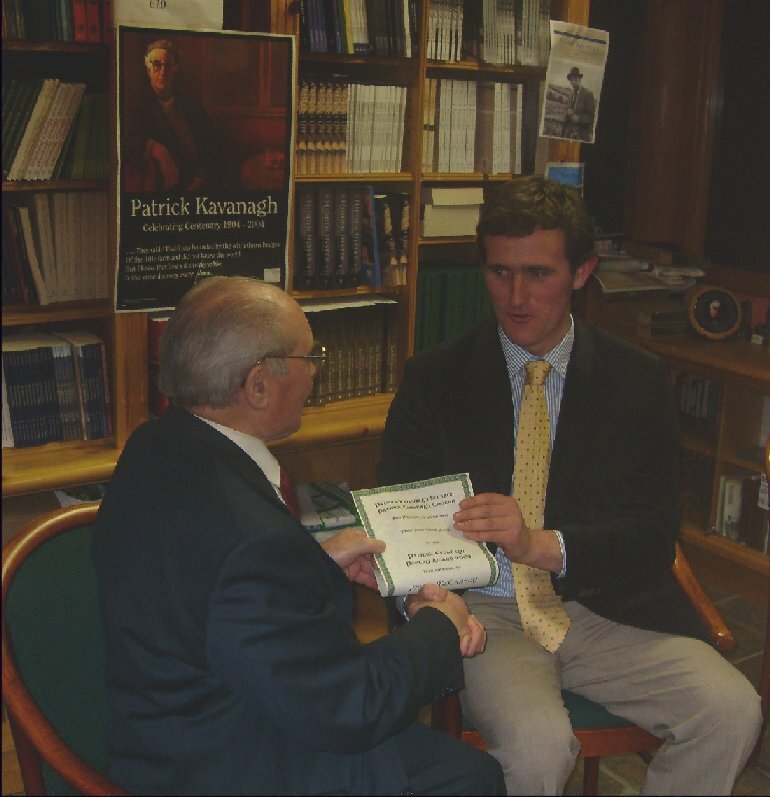 At the Patrick Kavanagh Awards presentation last week-end one of Martin Dyar's relations, his father I think, told me that I had mentioned Martin's great grand father in my book on sligo in the War of Independence. 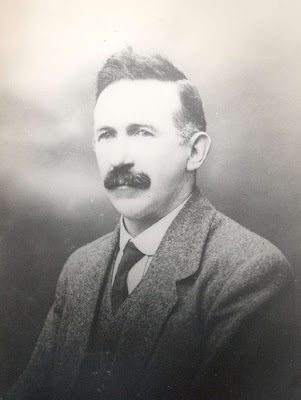 He was Patrick Dyar (pictured above), a shopboy in Cooke's shop in Tubbercurry, who was an early advocate of Sinn Fein and the Volunteers in Sligo. He organised an anti-recruiting campaign in the area in late 1915 and for this he was arrested and put on trial and sentenced to one month hard labour. On December 27, 1915 Dyar returned to Tubbercurry after being released from Mountjoy jail and there was a great welcome for him in spite of inclement weather. The brass band met him at the train and a bonfire blazed at the square. Local dignitaries welcomed him and presented him with an address of welcome. Patrick Dyar left Tubbercurry early in 1916 and set up a business in Castlerea, County Roscommon where he spent the rest of his life. I presume that Martin, his grandson, (above)was not welcomed by a brass band when he returned home to Swinford with the Patrick Kavanagh Award last week-end. This is one of the most striking images in the Annual. It's by Irish artist Emma Gamble. The bio says "She has continued to create work designed to question accepted notions, such as the belief in the existence of a childlike innocence." This work seems to be in that vein. That chilling knowing look on the child's face and that row of dog (jackal? Anubis?) headed creatues waiting patiently for . . .? And the box? A confession box? I haven't heard of this artist and found nothing on the internet but the image is striking. 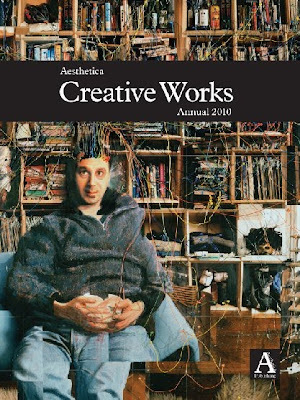 The Aesthetica Creative Works Annual 2010 can be purchased on the website. Just got my copy of the 2010 Aesthetica Creative Works Annual published by Aesthetica magazine the bi-monthly arts and culture publication. One of my entries, a poem called Flying to Krakow, was a finalist and so is included in the annual which also contains artwork and stories. They had over 12,000 images submitted, 3000 poems and 3000 short stories. There were 40 finalists per category. As far as I can see the only other Irish poet included is Paul Jeffcott who lives beside the Mountains of Mourne. The graphic art in the annual seems to me to be terrific, very varied and very impressive. Graphic artists from or working in Ireland whose work is included are Debbie Chapman, Emma Gamble, Emmet Mullins and Katarzyna Gajewska. I was surprised and delighted to be so lucky. The poem selected is much more traditional in form and theme than the one successful in the Kavanagh competition. When a poem you've written some time ago is noticed you look at it with fresh eyes almost as if it was written by someone else. This poem is a fourteen line sonnet-like poem with the first eight lines setting a scene and the last six making a personal reflection on the scene. spires – tarnish hectares of conifers. This is the blurb for the annual: The second Aesthetica Creative Works Annual explores the imagination. 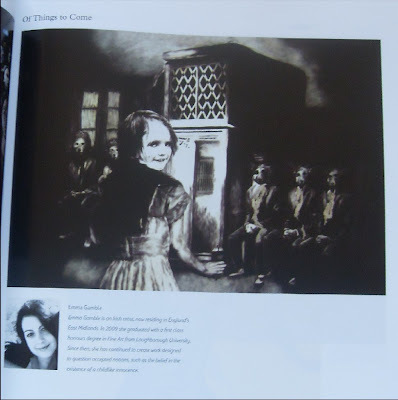 This book showcases artwork and creative writing from over 30 countries. The anthology contextualises the larger cultural framework by asking probing questions about the current state of affairs: the economy, globalisation, technology and the environment. Moreover it offers a platform from which to analyse the art we producing today. Its cutting-edge nature offers you autonomy. As the reader, this book provides an insight into our deepest thoughts, anxieties and aspirations. Art becomes the tonic for the modern world. The cover image above is by mixed-media artist Shadric Toop. Just got the December issue of the American Poetry magazine. Thankfully no Christmas poems though it has a very good one called Advent by Nate Klug. 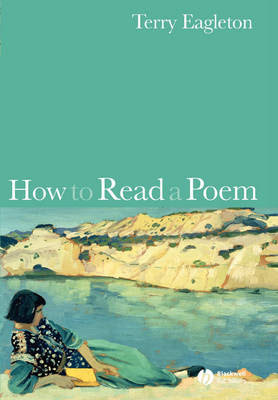 In a previous issue a letter to the editor by Christopher Conlon criticised this statement by Katha Pollitt’s in her memoir of Elizabeth Bishop: whatever way a poet reads his or her own work is fine, is, in fact, perfect, because the way they read is part of their sensibility, their own personal expression of their poem. Conlon said: As someone who has run a poetry reading series for the past ten years, I can state most assuredly that Pollitt is wrong. I have watched countless poets — deeply talented, even brilliant poets — utterly wreck their readings and bore the audience nearly to tears. This December issue has a further letter to the editor on the issue by Belle Randall, Seattle, who says: Judging poets as performers can only lead to poets who cultivate the skills of news anchors, Broadway actors, or other performers. This may be right for some poets, but certainly it is not right for all. Indeed, many of us value poetry precisely because it does not speak with the glibness of the polished public speaker. 1. It is very interesting to hear the individual way a poet perform his/hers own work. 2. Some readers of their own work do it very badly. 3. Poets reading their own work should not think of themselves as performers and should value their individual style. You can read most if not all of the magazine online and there is also a podcast. There is an Open Mic event in Kells, Co Meath tonight at 9pm in the Railway Bar near the GAA grounds. I love this! 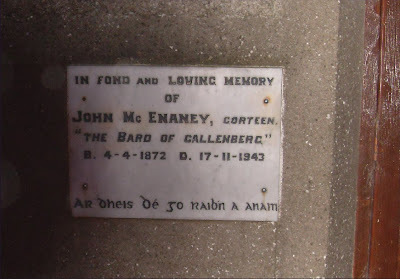 On the side of the Patrick Kavanagh Centre in Inniskeen, the former parish Church, is this plaque commemorating another local poet John McEnaney. It's as if to remind us that poets like Kavanagh don't arrive from nowhere and that there are many levels of poetry. I don't know much about McEnaney but on the Carrickmacross tour on last Saturday morning Larry McDermott the excellent guide mentioned that if you had a dispute with a neighbour instead of going to a solicitor you went to McEnaney the Bard and he would write a scurrilous attack on the neighbour for you. He also wrote ballads commemorating important local events and one of his most famous poems celebrated the victory of the Inniskeen Grattan Irish footballers in 1888. There is a mention of the Bard here in the book Patrick Kavanagh by Darcy O'Brien and Kavanagh mentions McEnaney in his article A Poet's Country in The Word. 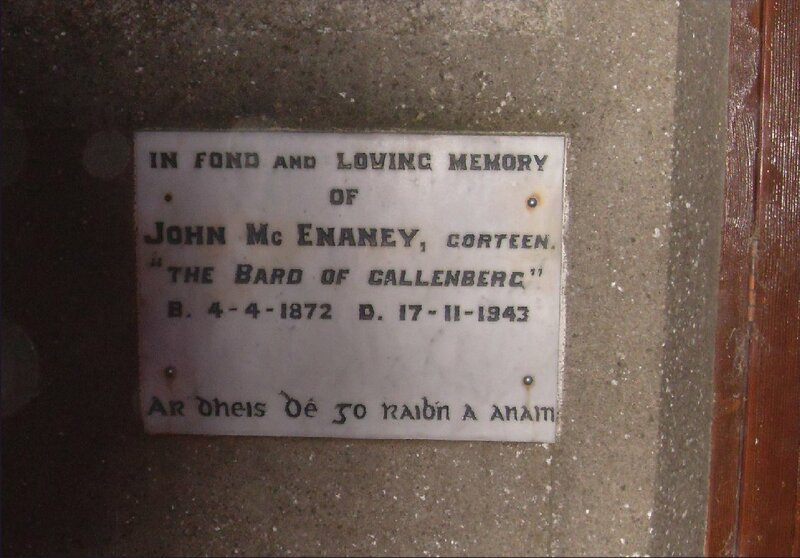 There is also an article The Bard of Callenberg’ in the Irish Farmers’ Journal, February 4,1961. One of the talks at the Kavanagh weekend on the Saturday was My days with Patrick Kavanagh by Godfrey Graham. Godfrey was a cameraman with RTE for many years and also played cricket for Ireland. He talked about filming the 1966 documentary with Patrick Kavanagh in Dublin and Inniskeen. Frank McNally had said the previous night that Kavanagh had been a constant critic of RTE but was delighted to accept their offer to make a documentary with him. Godfrey told us how when they were having a picnic lunch in Monaghan during the filming a cameraman from Ringsend spotted a kingfisher at the river and caught it. It had an injured wing. Kavanagh held it in his large hands and said I can feel its heart beating. Godfrey, like any good cameraman, grabbed his camera and filmed the hands with the injured bird and Kavanagh's face. His eyes were full of tears, Godfrey said. The clip was used in the film and is available on the RTE archives on this page. Kavanagh took the injured bird back to his sisters' house where it was cared for. 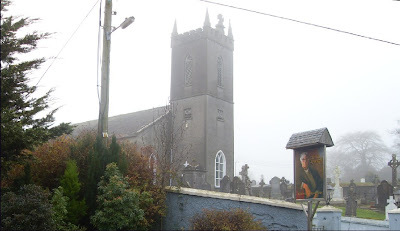 The Patrick Kavanagh Centre (above) is the renovated disused Catholic Church in Inniskeen in the graveyard of which the poet himself is buried. It is a pleasant venue with artwork and mementoes of the poet here and there. On Friday evening it was packed for a lively variety of entertainments. When I arrived after a being treated to a meal by the committee local Uilleann piper Patrick Martin was finished his set. Then the results of the poetry competition were announced and prizes and certs presented. No sponsor this year. The judge spoke saying that there were in the region of 150 entries this year which is close to the normal. Of these he regared thirty as being serious contenders. These he narrowed down to 10 then to 5. These became the winner, Martin Dyer, the joint seconds, Shirley McLure and Teresa Lally and joint thirds, Justin McCarthy and myself. Martin then read some of his prize-winning entry. His reading style was very confident and slow and he entranced the audience by his pauses and emphases. His material was based on everyday events, real and imagined. I missed the start of Frank McNally's talk because photographs had to be taken but I enjoyed what I did hear. He talked of Kavanagh, the contrary man who went out of his way to make enemies especially among the writers and would-be writers of Dublin. A man who was neither at home in Monaghan or in Dublin. He especially talked of Kavanagh the newpaperman, the columnist for a number of papers and the publisher of the famous Kavanagh's Weekly. Nothing very new here but a well reasoned picture of a difficult man. Then poet Ciaran Carson played the tin whistle and read some of his own poems including the well-known Belfast Confetti finishing with an emotional rendition of Kavanagh's poem Innocence. Pádraigin Ní Uallacháin works with Carson at the Seamus Heaney Centre in Belfast and with harpist Helen Davies she sang songs in Irish and English from the whole history of Irish song. An entrancing set. She finished with Kavanagh's Raglan Road. This was terrific. I have heard this song murdered so many times by singers who seem to want it to last forever and drag it out that it is great to hear it done well - at a proper pace. Padraigin is the author of The Hidden Ulster - People, Songs and Traditions of Oriel. Just back from a very enjoyable evening and day at the Patrick Kavanagh Weekend in Inniskeen, Co Monaghan. The results of the Poetry Competition were announced last evening. First place went to Martin Dyer, a native of Swinford, Co Mayo. Joint second were Shirley McLure, Dublin and Teresa Lally, Mayo. Joint third were Justin McCarthy, Sligo and Michael Farry, Trim (me!). Above the winner with Kavanagh Committee chairman Peter Murphy. I was delighted to be mentioned, having entered for the past four or five years without any success. Judge, poet Brian Lynch said that my entry, as well as being full of strange and interesting information, was extremely well written and, in the Kavanagh sense, comic. This year instead of putting a collection of twenty poems together I entered two longer sequences of poems which together amounted to twenty. The main one describes a walk from Ballsbridge to Dublin centre and back while waiting for someone who was having dental treatment in Ballsbridge. It's a wandering freeflowing meander through the city with thought, comments and memories triggered by the sights and sounds and has quotations from songs, novels etc. It's punctuated by factual information on the history of dentistry and especially false teeth. 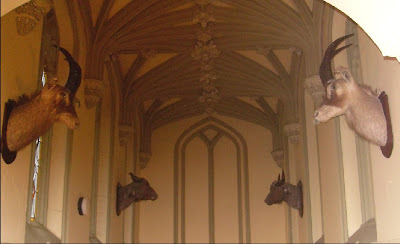 This makes it a bit odd or quirky and I presume this was what caught the judge's attention. More tomorrow on Kavanagh weekend. 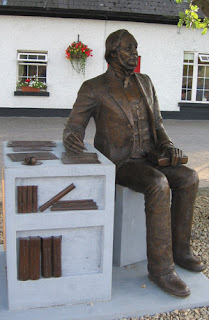 I hope to attend at least some of this weekend's annual Patrick Kavanagh Weekend in Inniskeen, Monaghan, a celebration of the life and work of one of Ireland’s best loved poets. It takes place from Friday to Sunday. Friday evening will see the announcement of the results of the Patrick Kavanagh Poetry Award which is now in its 39th year. This is a competition for a poetry collection and past winners include many who have become well known names in the Irish poetry world including Eilean Ni Chuilleanain, Paul Durcan, Conor O'Callaghan, Pat Boran and Peter Sirr. Last year's winner was Geraldine Mitchell from Co. Mayo. Poet, playwright, novelist Brian Lynch is the Judge for this year’s competition. Also on Friday evening the Keynote Address entitled A Stake in the Country will be delivered by Irish Times columnist, Frank McNally. He was born close by in Carrickmacross. Later at 9pm award winning poet and flute player Ciaran Carson, one of Ireland's most celebrated and prolific poets, will read from his own works and will be joined by local singer Pádraigín Ní Uallacháin, accompanied by internationally acclaimed harpist Helen Davies in a concert of words and music: From Amergin to Kavanagh. The full programme, including poet John F. Deane reading from his recent collection A Little Book of Hours, is available at the link above. 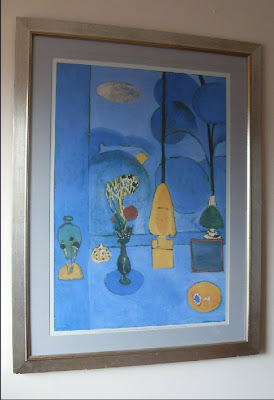 Kavanagh painting above by William Mulhall from the Apollo Gallery website. Check out his portrait of Dylan! Just got the results of this competition. Winner this year is Ray Mullen, Dublin 24; second place goes to Mary Turley McGrath, Letterkenny and third to Boyne Writers Group member Evan Costigan. Well done! Six are Highly Commended including David Mohan, a member of Lucan Creative Writers Group and Louth native Adrienne Leavy, at present studying in Phoenix, Arizona. She was a visitor at one of our meeting during the summer and has been published in Boyne Berries. There were ten Commended entries including Orla Fay of the Boyne Writers Group and myself. Also in this group is Sinead MacDevitt from Navan who has been published in Boyne Berries a number of times. I was also commended in this competition two years ago. The awards ceremony will take place in McDowells, Emmet Road, Inchicore, Dublin on Tuesday 8 December at 7.30pm. all welcome. 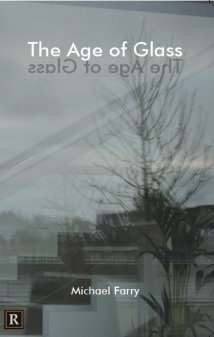 Poet, John F Deane, will read in Blanchardstown Library tomorrow night (Thursday 26 November) at 7pm. His latest collection is A Little Book of Hours. Went to Blanchardstown branch library last week, brought back my Rothko print and borrowed a Matisse - The Blue Window 1913 . The original is in the Museum of Modern Art, New York. Quite a contrast to the Rothko though still very much based on the eccentric (is that the correct word?) use and appreciation of colour. When I was in Nice, France recently I visited The Matisse Museum on the hill of Cimiez further up from the Chagall Museum. Matisse lived in Nice from 1918 until 1954 and the Museum has a collection of works left by the artist (and his heirs) to the city. Well worth a visit especially for the models and preliminary sketches for the chapel at Vence which he designed. Vence is a city close to Nice and the chapel designed by Matisse is famous. Just back after a busy few days. A family get together in Markree Castle Hotel, Collooney, Co Sligo at the week-end. We drove through rain and wind and some flooding to get there on Friday and returned Sunday morning. One of the historic landlord's houses of County Sligo, still owned by the same family who got the estate in Cromwell's time. The house has been renovated and is a most interesting place. Certainly not destroyed by renovation it retains much of it character. Lots of information and pictures on the website. 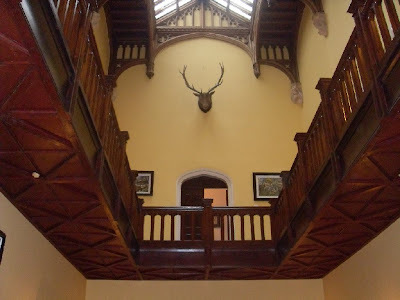 Short history of the Coopers and Markree Castle here. A most enjoyable stay there though surely the Full Irish Breakfast does not include beans. That's the full English Breakfast! Picture above: the impressive wooden stairs with animal head and some artwork from an exhibition Shifting Fields by the North West Artists Group which is on at the Hotel at the moment. The North West Artists Group was founded in May 2009 and includes artists from all over the North West of Ireland. 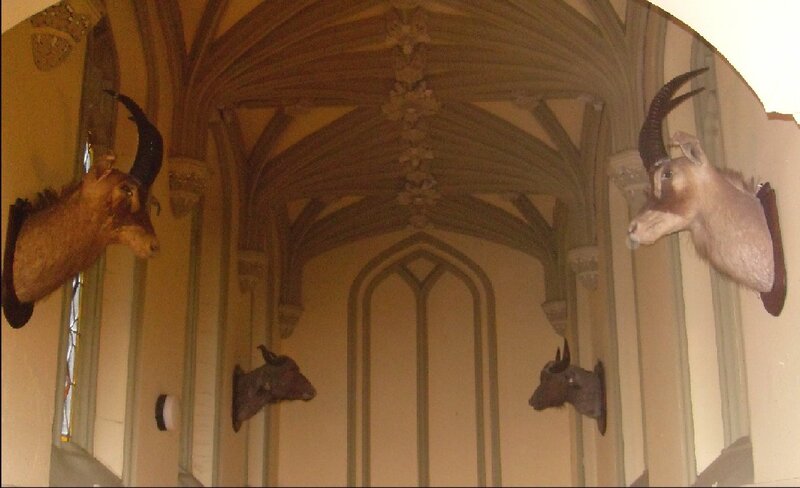 Picture below: More mounted animal heads at the front entrance hall, presumably brought back from African safaris. One of the most famous of the Cooper family was Bryan Cooper, politician. He was one of the few Unionist MPs who became TDs in the new Dáil after the War of Independence. He sat as an independent and later as a Cumann na nGael TD for the constituency of South Dublin until he died in 1930. Then there was the Cup Final on Sunday afternoon. More rain, wind, cold, elation followed by disappointment. Supporters of Sligo sports teams are used to disappointment. Come On The Bit O' Red! Sport, you can't beat it for the unexpected. Who would have forecast the happenings in Paris on Wednesday night? Certainly not Eamon Dunphy and company. One of the reasons following sport and watching live sport is so enjoyable is that it is impossible to predict the outcome and that at any moment during the event the unexpected may happen. It happened towards the end of the Ireland Australia rugby match last Saturday and again on Wednesday night. I have given up watching or listening to pundits before, at half time or after matches. Listening to the commentator and his "helper" is unavoidable if you want the atmosphere of the event. 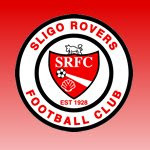 Now all eyes (well quite a few) turn to Tallaght for next Sunday's Cup Final between Sligo Rovers and Sporting Fingal. After a difficult season Rovers have avaoided relegation and reached the cup final. Normally they would be underdogs in such a match but their opponents were a first division club so Sligo will be uncomfortable favourites. We all know what can happen to favourites. Bad weather and the resultant small attendance did not spoil what turned out to be a very enjoyable Reading and Open Mic session last night in Trim. The two featured readers gave very good performances. Tom French read some poems from his first book but most of his material came from his recent publication Touching the Bones. Tom recently read with Michael Longley at the Manchester Literature Festival. 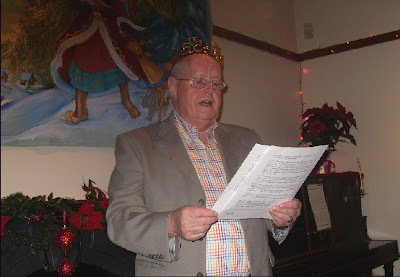 Among the poems he read was Srahnamanragh which has appeared in the Manchester Review online. The other featured reader James Lawless, read from his two novels, Peeling Oranges (2007) and For Love of Anna (2009). He has had a book of criticism Clearing the Tangled Wood: Poetry As a Way of Seeing the World published in America and his latest novel had been accepted by Words on the Street, Galway. It's not easy to read extracts from a novel and give a real flavour of the book but James succeeded by judicious mixing of explanations and extracts. Back to Nice, France again. 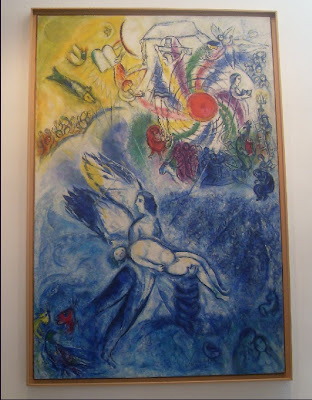 I took the opportunity to visit the Musee Marc Chagall. This celebrated Russian-born artist (1887-1985) spent the last years of his life near Nice and the museum contains a large collection of his work particularly the series based on Bible stories. I must admit I was not very familiar with his work and the paintings made a great impression. The fantastic (in its real meaning) use of colour and composition to create images which are both dreamlike and realistic. You can see the influence of cubism, surrealism and fauvism but his paintings never seem to fit into any of those categories. 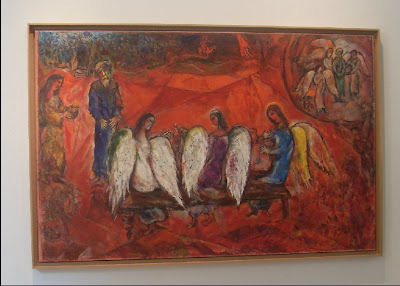 More about Marc Chagall here and here. Carlingford, Co Louth, was the birthplace of Thomas D'Arcy McGee (1825-1868) who was a well known politician, poet and journalist. He lived in Wexford and America before returning to Ireland where he became involved in the Young Ireland movement and the rebellion of 1848. When that collapsed he went to Canada. In his later life he became a vehement opponent of the Fenians and he was assassinated in 1868. It was widely believed that the Fenians were responsible. More on McGee here and here. Above: former ICT Advisors pay their homage including one McGee! The monument, a small head of McGee, is very well presented at a prominent position near the shore in Carlingford. There doesn't seem to be any mention of the sculptor's name on the monument which is a pity. 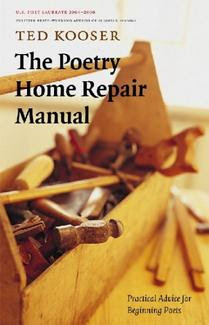 McGee was a poet and his collected poems can be seen online at many sites including here. His Salutations to the Kelts was often included in older Irish text books and school poetry books. This is the first stanza. Great to attend a reunion of colleagues who were train blazers as regards ICT in Education - the ICT Advisors who were attached to Education Centres in Ireland until summer 2008 when the service was suddenly cut. Carlingford, Co Louth was the location for the reunion and on Saturday we walked the one and half hour walk from Glenmore over the Golyin Pass down into Carlingford. 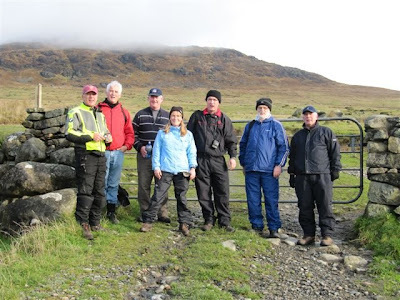 The weather was clear and it was an enjoyable walk with magnificent views over Carlingford Lough from the top. Picture above the group at the start of the walk. 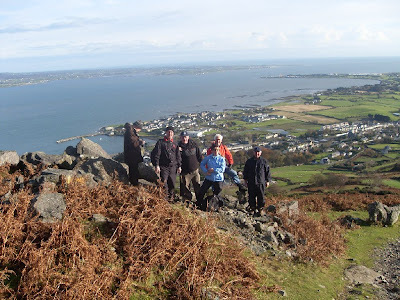 In the picture below Carlingford is behind the group and the port of Greenore to the right. The Golyin Pass is an old traders' short cut pass across the mountain. There is a well-built causeway most of the way up the mountain which helps. This is part of the Táin Way and to our right as we walked was the mountain called Barnavave or Maeve's Gap. To the left was Slieve Foye. The Táin Bó Cualgne is a well known ancient Irish saga. The translation by Thomas Kinsella (1969) with illustration by Louis le Brocquy is a well known version. More recently Ciaran Carson has published a well received translation (2008). Of course it all began, The Táin that is, with some pillow talk in Connacht, in Rathcroghan in modern Roscommon where Maeve and her husband Ailill lived. The Co Meath based poet, Tom French, will be one of the featured readers at the Boyne Readings and Open Mic in Trim next week. Tom lives in Laytown and works in Navan in the Local Studies Division of the Meath County Library Service. The Trim readings, which are organised by the Boyne Writers Group, will take place on Thursday, 19th November, in The Village Hall of the Knightsbridge Retirement Village, Longwood Road, starting at 8pm. Visitors are very welcome. 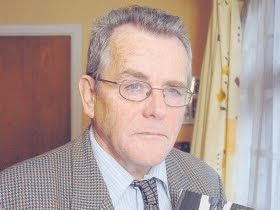 The other featured reader will be James Lawless, a novelist/poet/playwright who lives in Co Kildare. 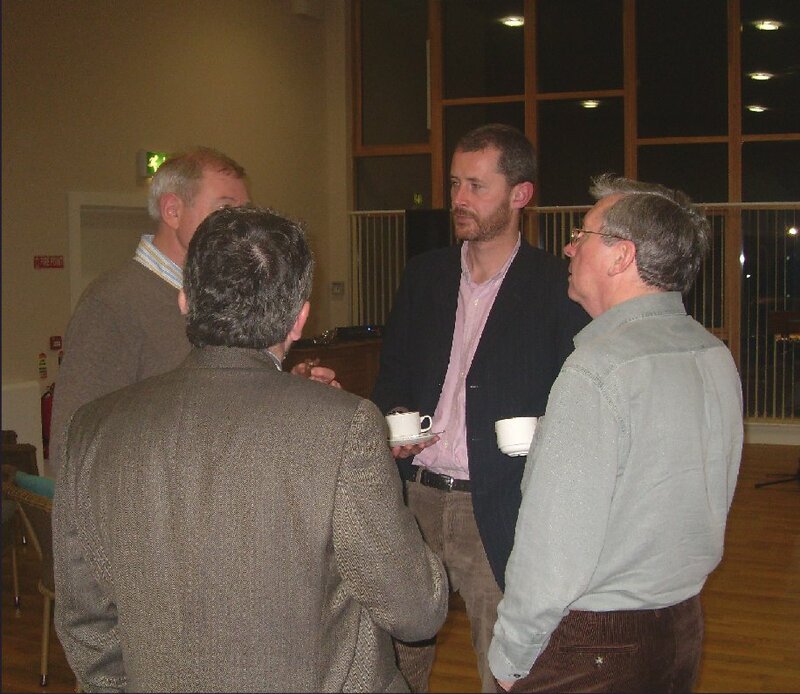 Tom French is a popular figure in Meath literary circles. 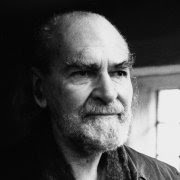 A native of Co Kilkenny, he came to public attention in 1999 when he received a Bursary in Literature from The Arts Council, and his work was awarded the inaugural Ted McNulty Prize. 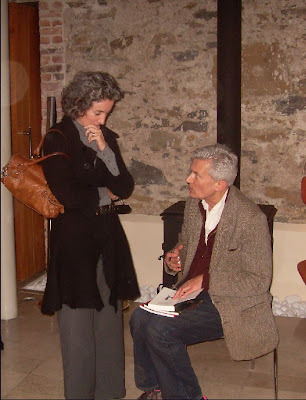 His first collection of poetry, Touching the Bones, was published in 2001 by the prestigious Gallery Press, Oldcastle, and won the Forward Prize for First Collection, 2002. 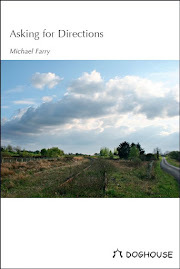 His second collection, The Fire Step, was published last month, also by Gallery Press. James Lawless is a Dubliner living in Co Kildare. His first novel was Peeling Oranges, published in 2007 by Killynon House Books, Mullingar. 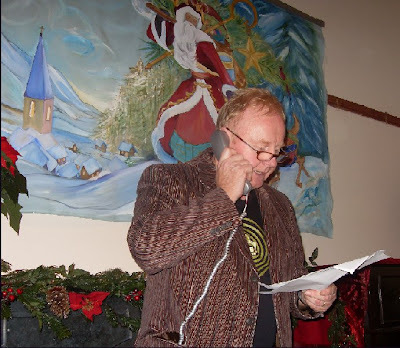 He has had numerous award-winning short stories and poems published and broadcast in Ireland and the UK. His story Jolt was shortlisted for the Willenden Prize. His other awards include the Scintilla Welsh Open Poetry competition in 2002 and the Cecil Day Lewis Play Award 2005 for What Are Neighbours For? James has had two books published this year: Clearing The Tangled Wood: Poetry as a way of seeing the world, and a novel, For Love of Anna. The Boyne Readings and Open Mic sessions are held on the third Thursday of the month. Anyone who would like to read their own material at any of the sessions is very welcome. The sessions have been attracting up to 35 people. Admission to the Boyne Readings and Open Mic is €5, which includes tea/coffee and biscuits. Enquiries to Paddy Smith 086 1577526 or Michael Farry 086 8283314. 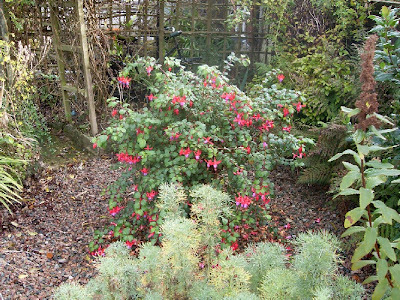 One of the highlights of my garden, still flowering, is this fuchsia. (Photograph taken two days ago). I planted this small fuchsia in the top of a bit of the trunk of a tree which my sister in law brought me quite a number of years ago and it grows there every year, dies back in the winter, flowers luxuriantly every summer and well into the autumn. Fuchsias are, according to the British Fuchsia Society, characterized by entire, usually opposite leaves, pendent flowers, a funnel-shaped, brightly coloured, quadripartite, deciduous calyx, 4 petals, alternating with the calycine segments, 8, rarely 10, exserted stamens, a long filiform style, an inferior ovary, and fruit, a fleshy ovoid many-seeded berry. So now you know. 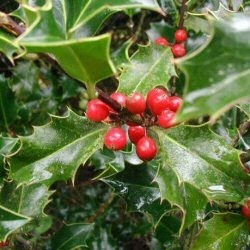 It was a suprise to me to learn that they are not native to Europe, but of North and South America and were only introduced to Britain in the early 1800s. In Ireland it is common especially in the West and South. I associate it especially with the seaside area of Sligo where my father came from - between Ballisodare and Ballina. I spent many summers on holidays there and remember the huge hedges of fuchsia. It had been so named by the plant collector Charles Plumier in honour of the German botanist Leonhard Fuchs (1501-1566). A very enjoyable Reading Rooms event in the Radisson, Cavan last evening featuring English poet Hugo Williams (pictured right signing books). The evening began with an open mic with ten readers. I read my Stamp Collecting poem and my Auschwitz poem. Both seemed to go down well especially the Stamp one - Hugo Williams even mentioned it in an introduction to one of his boyhood poems and wondered if we were more or less the same age. A nice variety of material in this section with LitLab members prominent. Three singer/songwriters took part in the open mic including Michael O'Brien from Cavan who sang at the October Windows launch in The Writers' Centre, Dublin a while ago. He sang his City of Mirrors song based on the Gabriel García Márquez novel One Hundred Years of Solitude - a great song. The first half concluded with Lisa O'Neill, a Cavan singer/songwriter with an Electric Picnic performance among her accomplishments. Her performances of her own songs and one cover went down very well. She even sang a song to Bob Dylan - impossible to get away from him these days. The second half started with a reading by Ciarán O' Rourke, a young Dublin poet, who has won the Cúirt New Irish Writer Award and also won an award at the Listowel Writer's Festival. Again the audience responded well to his readings and his fine introductions. Then we had Hugo Williams. He read for at least half an hour, many "greatest hits" plus a generous selection from the new volume West End Final shortlisted for the T.S. Eliot prize. He started with the hilarious (or is it very sad) Breakfast in Bed from the new book. The hits included the four that can be listened to and read on the Poetry Archive. Some poems he introduced at length, other barely any introduction. He established a rapport with the audience straight away and they responded with great appreciation of the nuances and humour of his lines. I envy his easy style, the effortless delivery, the wit and humour which often conceal great sadnesses and trauma. He read a number of poems about his mother including one about her cremation. One the Poetry Archive website he includes this saying by Fred Astaire - If it doesn't look easy, you aren't working hard enough - which seems to sum up his work very well. All in all a great night with over fifty in attendance. Well done to the organiser Cavan native writer Rebecca O'Connor, who has taken part in the Caomhnú and Flat Lake arts and literary festivals. She hopes that this was the first of a series. The Reading Rooms events are funded by Cavan County Council's arts office. Going to see English poet Hugo Williams tonight in Cavan. The first few paragraphs of his Wikipedia entry (presuming it's correct!) gives a flavour of who he is. 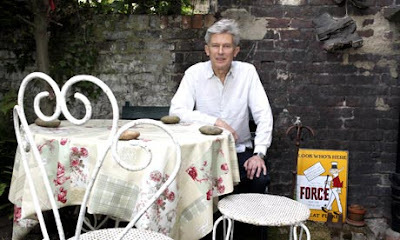 Hugo Williams (born 1942) is a British poet, journalist and travel writer. His full name is Hugh Mordaunt Vyner Williams He is the son of actor Hugh Williams and the model and actress Margaret Vyner, who co-wrote some upper-middle-class comedies in the late 1950s. His brother is the actor Simon Williams, and his sister Polly was married to the actor Nigel Havers until her death from cancer at the age of 54. 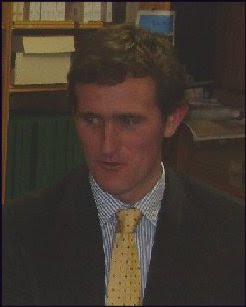 Williams attended Eton College. He is a regular contributor to the "Freelance" column in theTimes Literary Supplement and is poetry editor for the Spectator. Williams has been poetry editor and TV critic for the New Statesman, theatre critic for the Sunday Correspondent, film critic for Harper's & Queen and a writer on popular music for Punch magazine. I have listened to his Poetry Archive CD and his reading style and content fit in exactly with what might be expected from his biography. His style is disarmingly off hand almost casual and it takes at least a second listen to appreciate the full significance, depth and sometimes terror of his material. You can listen to some of his poems at the Poetry Archive. Her News is one of my favourites. He writes a lot about his father and his latest book West End Final includes some dealing with that relationship. Guardian interview here. Picture above from Guardian article. The reading is on at 7.30pm in the Radisson Hotel, Cavan. He will be accompanied by a young poet from Dublin by the name of Ciarán O’Rourke and Cavan’s very own musical star, Lisa O’Neill. The event is sponsored by Cavan County Council Arts Office.There’ll also be an open mic slot for singers and poets. Hmmm what will I read, somehow the Bob Dylan poem or the Fish and Chips poem don't seem to strike the right note. I'll think carefully about this one! Another piece of public sculpture in Nice. 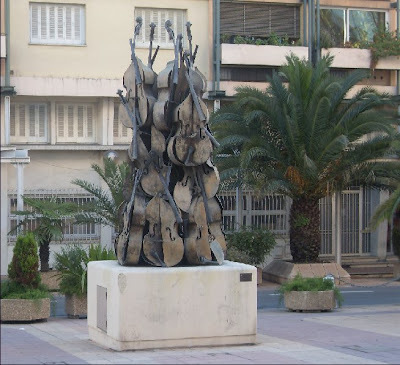 Entitled Music Power it is by the Nice-born French artist who called himself Arman (1928-2005). His official site. At one stage in his career his speciality was sculptures which were accumulations of an object in this case musical instruments. He has created a number of similar sculptures. In my opinion it's another of those sculptures where once you get the idea you lose interest - like the gun with the knotted barrel I saw in Luxembourg. 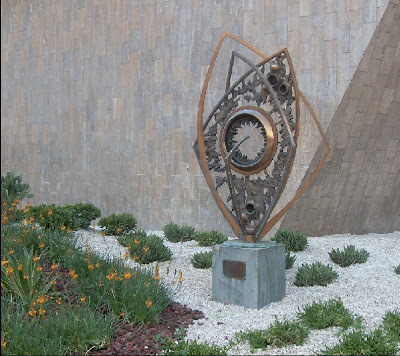 Now this sculpture below which is in the same area is much more interesting to my mind. I don't know who it is by nor do I know what it is about or what it means but surely that's the point isn't it?